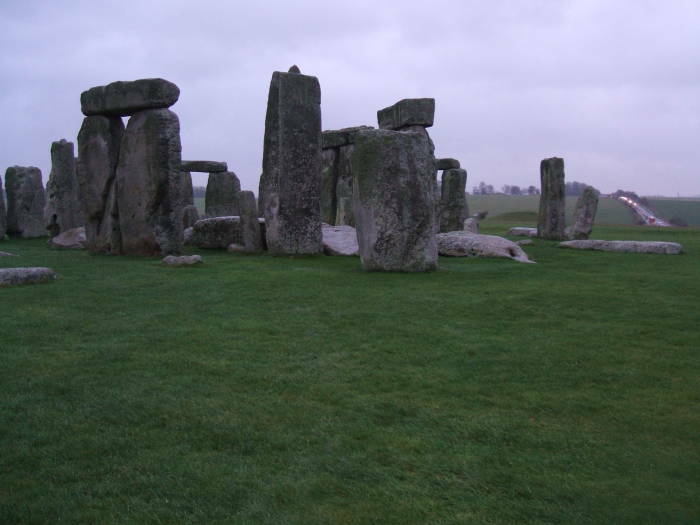 Stonehenge is one of the most famous prehistoric sites in the world. It is made up of earthworks surrounding a circular setting of large standing stones. It is one of several megalithic type structures in the area, including some enormous earthworks, Woodhenge, and Durrington Walls. Archaeologists have found four or five large Mesolithic postholes dating to around 8000 BC beneath the adjacent tourist car-park. 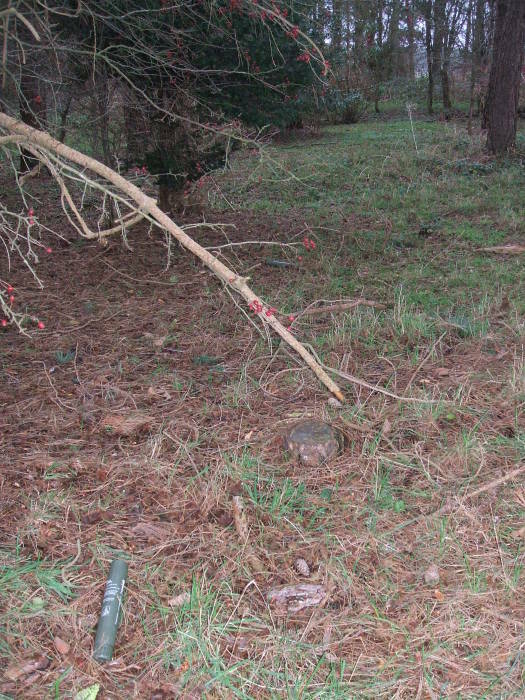 These held pine posts around 0.75 metres (2.5 ft) in diameter which were erected and left to rot in place. Three or four of the posts were in an east-west alignment and may been part of some structure with ritual significance. Around 4000 BC a cursus monument was built 600 metres north of the site as the first farmers began to clear the forest then covering the area. The earliest phase of the main monument, the surrounding circular earth bank and ditch, has been dated to about 3100 BC. 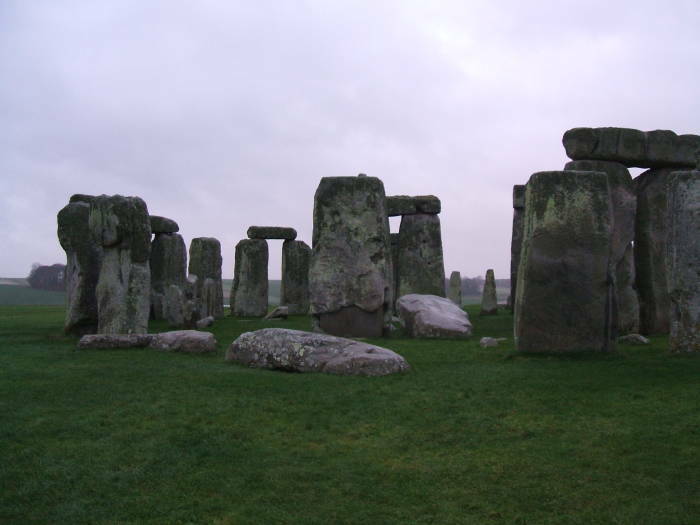 The standing stones were erected around 2200 BC. 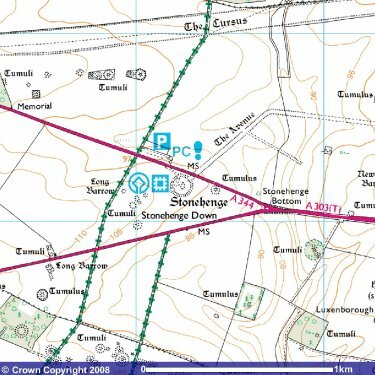 Stonehenge is located very near the junction of highway A303 and the smaller and less traveled A360, just west of Amesbury. The 1:50,000 map 1:25,000 map above show Stonehenge itself and the connected Avenue. Just to the north is the large Cursus. 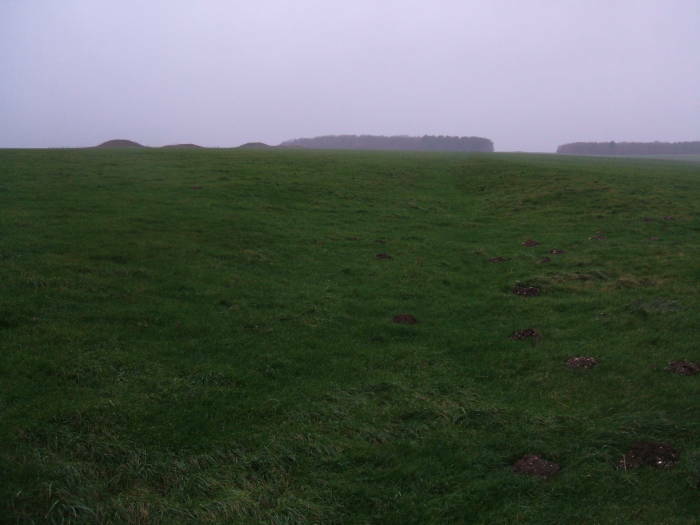 Some long barrow tombs and several tumuli are scattered around. I am approaching Stonehenge from the north. 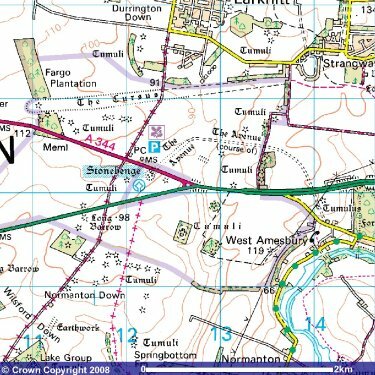 I'm on the path from Larkhill, crossing the fields and passing through the center of The Cursus. Stonehenge is just visible on the horizon above the end of this path. Some tumuli are on the horizon to the right. A little further along I cross into The Cursus from the north. Tumuli are visible to the south-west. Below, I cross The Cursus and look up its length toward the west. Even after millennia the large scale earthworks are visible. As we cross the Cursus and look up its length toward the east, Woodhenge is somewhere off in the distance beyond the last line of trees. Soon I arrive! Here I am starting on the very good self-guided audio tour put together by English Heritage. 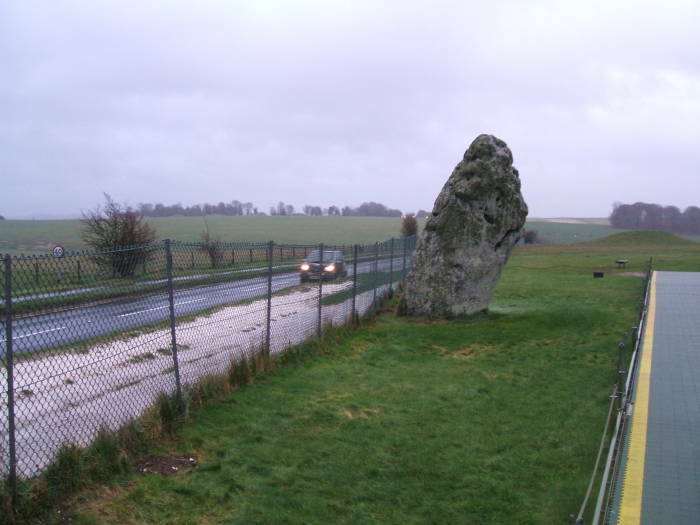 The A344 road runs right through Stonehenge, fairly close to the main circle of stones and right next to this outlying stone. The larger and busier A303 runs very close, and you hear the constant traffic on the A303 throughout your visit to Stonehenge. Woodhenge is just north of Amesbury, and about 3 kilometers from Stonehenge. 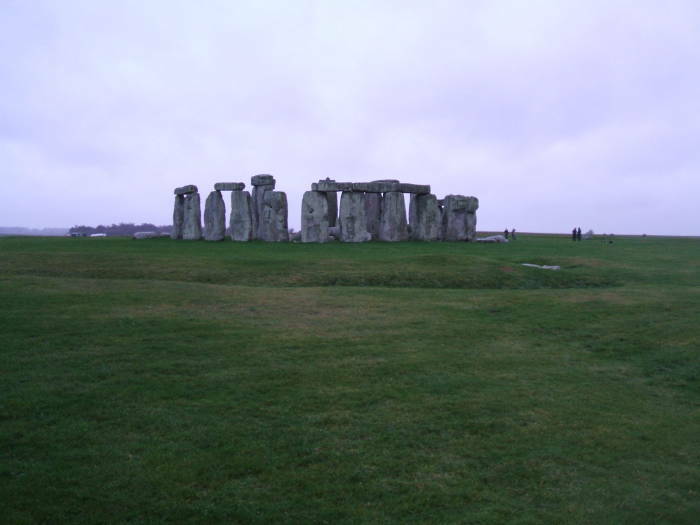 It was a wooden structure similar to Stonehenge, built about 2000 BC. Or, as it is reconstructed today, Concrete Post Henge. As a marker there says, "Woodhenge is so-called because it was originally a wooden structure of a type similar to Stonehenge. It was probably set up during the Bronze age circa 2,000 BC for ceremonial use. The concrete posts mark the positions of the original timbers, evidence for which was obtained by excavation. The rings are oval with the long axis aligned on the mid-summer sunrise. A bank with a ditch on the inner side surrounded the monument, which was entered by a causeway on the north-east." 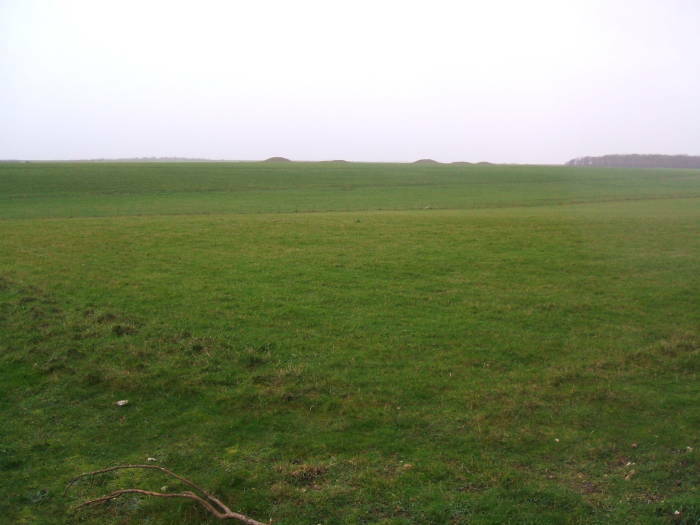 At Durrington Walls are remains of a settlement from the Woodhenge — Stonehenge era. It's a massive circular earthwork, or henge, about 500m in diameter. It was built in the Neolithic period around 3100-2400 BC. Excavations in 1967 revealed two circular timber structures and vast quantities of animal bones which could indicate that feasting took place there. Since summer 2004 archaeologists have located a number of hearthsites in sub-circular and rectangular wattle and daub huts and palisade postholes, identifying what may be an ancient village. 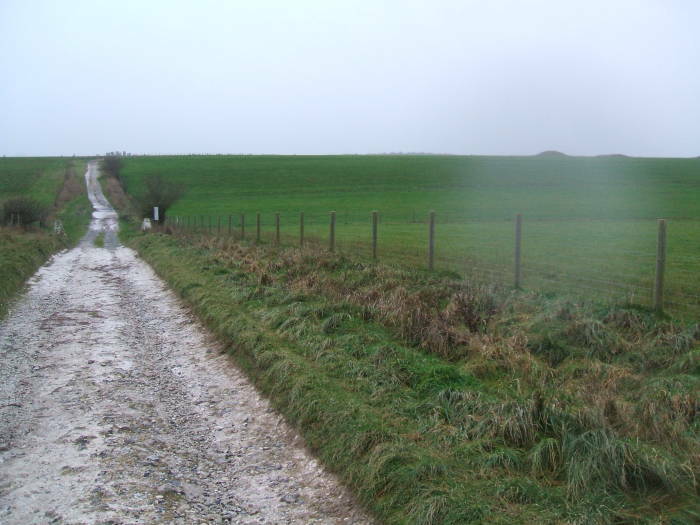 Distinct differences have been noted between the occupation floors at the center of Durrington Walls and those around the periphery of the site. 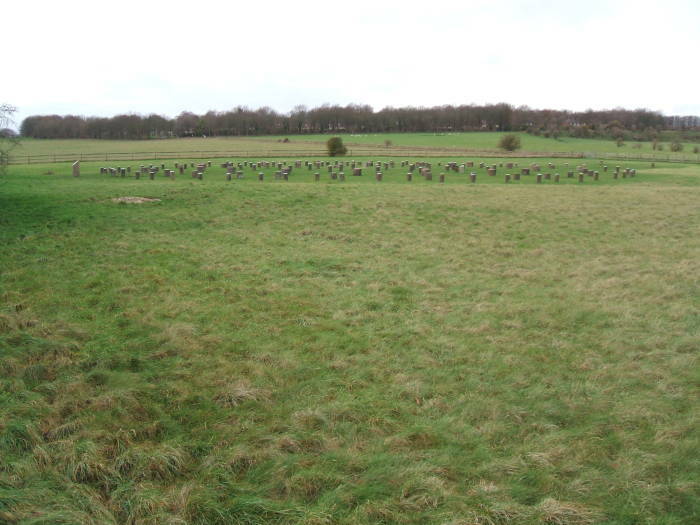 Those towards the centre are suspected by some researchers to have had a more ritualistic function than the more domestic-looking structures near the edge of the henge. Carbon dating suggests occupation somewhere around 2600-2400 BC, making it essentially the same age as the earliest Stonehenge formation. 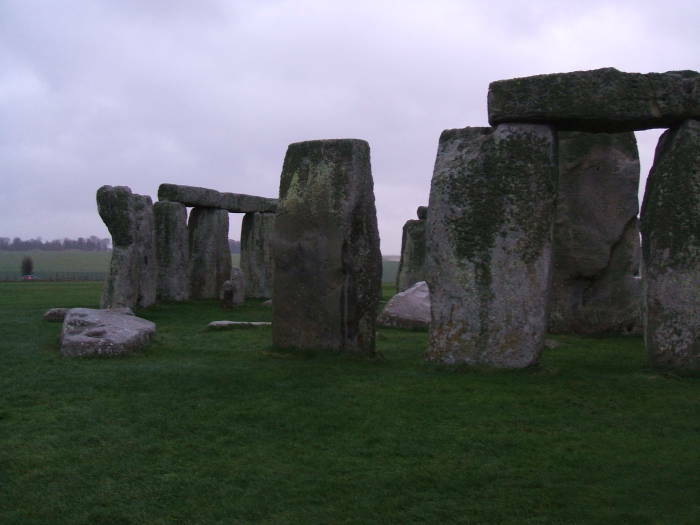 Early interpretations suggest that it was the settlement of the workers who erected Stonehenge. A circle of ditches and earthen banks at Durrington Walls enclosed concentric rings of huge timber posts. 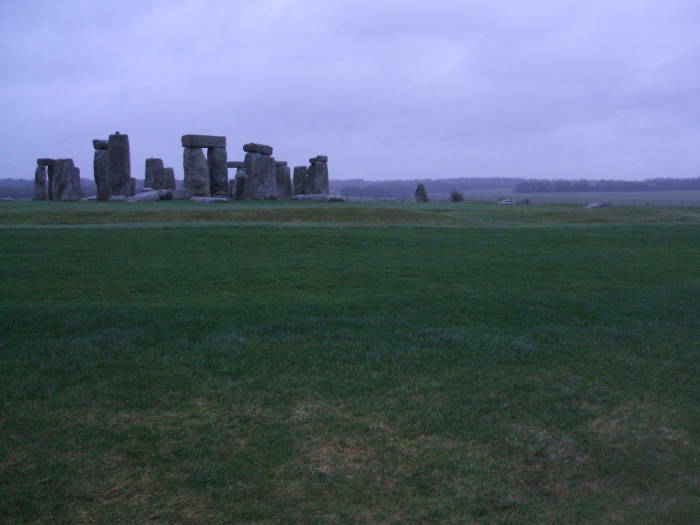 The archaeologist in charge of the excavation, Mike Parker Pearson, said that the evidence "shows us these two monuments were complementary" and that "Stonehenge was just one-half of a larger complex." See the English Heritage site and the Wikipedia page. 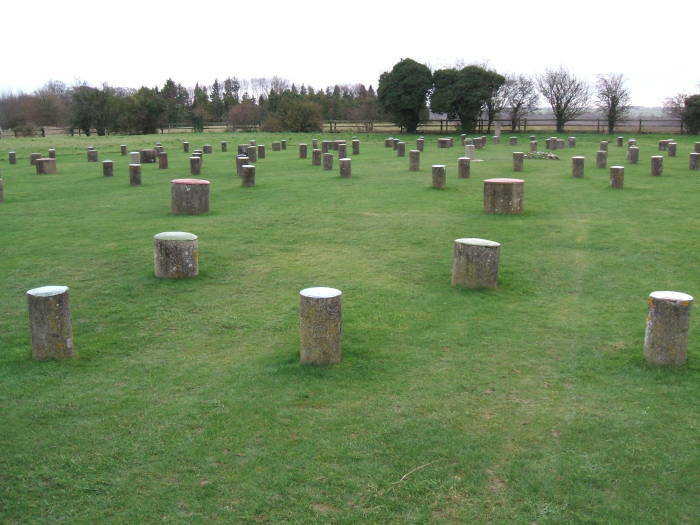 Woodhenge is a short walk north out of Amesbury along the A345. Durrington Walls is in the open area on to the north up the slight rise. The pub at the A345 / A3028 intersection is a nice place to get lunch. 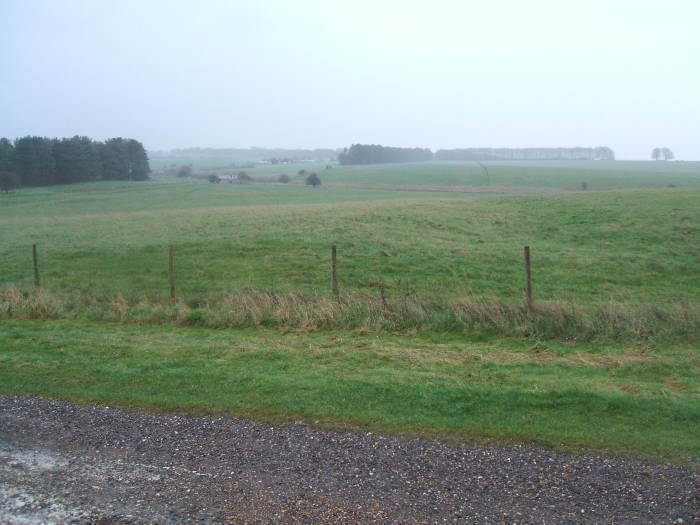 Stonehenge, Woodhenge, Durrington Walls, and the surrounding prehistoric structures are within MOD land. Stay on the path, there are at least expended flares in the woods off the path. MOD activities in this area include artillery training, so ordnance is possible. That's just an expended flare, but you still don't want to mess with it. You will probably notice low-level helicopter flights around the area, and possibly hear artillery and armor. 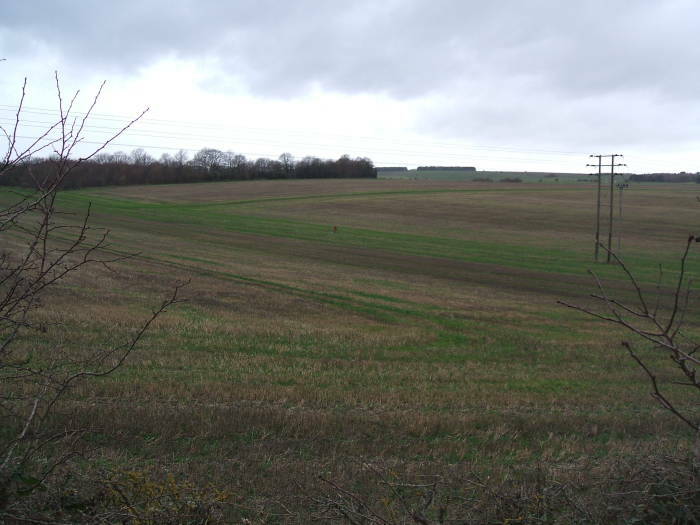 The Salisbury Plain is largely MOD land. There are plenty of places to find accommodation in Salisbury. I have stayed at the YHA hostel in Salisbury, a 200-year-old building in secluded grounds. 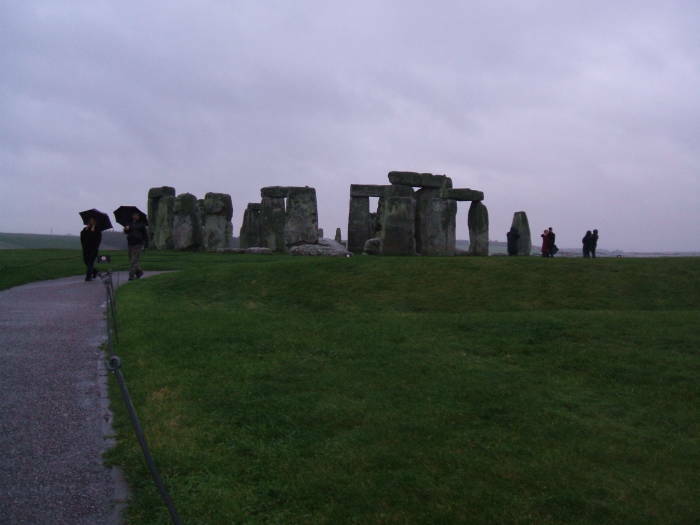 Amesbury and Stonehenge are maybe 20 minutes away from Salisbury by bus. There is an hourly tourist-oriented bus between Salisbury's main bus station and Stonehenge. But pay careful attention to the schedule and don't get stuck at Stonehenge — it could be a long 3 km trek back to Amesbury at the end of the day. You can take a bus to Amesbury and walk to Woodhenge, about 1.5 to 2 kilometers north along the A345. 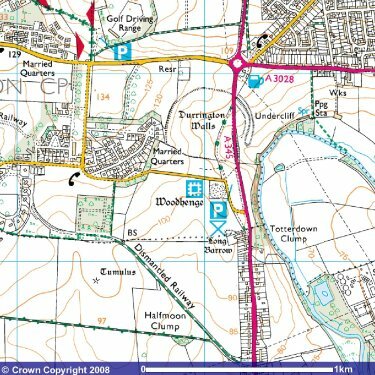 From there it's about 2.5 km to Larkhill, past the MOD barracks. Then turn south on a road that turns into a path leading directly through the woods (see the flare picture above) and across the fields toward Stonehenge (see the Stonehenge pictures above). Then catch a bus from Stonehenge back to Salisbury. 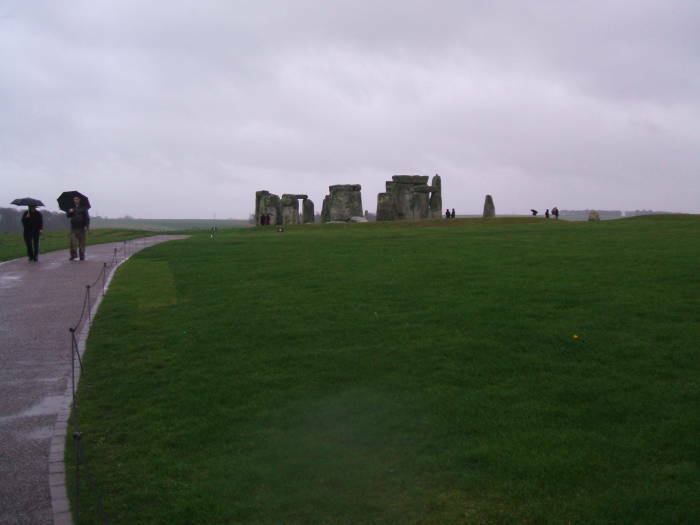 Stonehenge is the setting of the next-to-last chapter of Thomas Hardy's "Tess of the d'Urbervilles". After 57 chapters of rural English squalor, drunkenness, libertine seductions, poultry keeping, secret pregnancies, infant mortality, dairy farming, estrangements, Brazilian agriculture, misunderstandings, evictions, and misdirected letters, our heroine has given up on the husband who abandoned her (for Brazilian agriculture) and taken up again with the former libertine (who had become an itinerant preacher, but takes Tess as his mistress). The husband reappears, Tess sends him away, and then gets into a heated argument with the libertine-preacher. She stabs him, exsanguinating him to the extent that the landlady notices blood soaking through the bed and into the ceiling of the room below. Tess runs off and catches up to her husband, and they walk inland to hide for some time before escaping England from a port. They stay for five days in an abandoned house, are discovered by the cleaning woman, and take off cross country again, stumbling into Stonehenge in the night. Though the sky was dense with cloud, a diffused light from some fragment of a moon had hitherto helped them a little. But the moon had now sunk, the clouds seemed to settle almost on their heads, and the night grew as dark as a cave. However, they found their way along, keeping as much on the turf as possible that their tread might not resound, which it was easy to do, there being no hedge or fence of any kind. All around was open loneliness and black solitude, over which a stiff breeze blew. They had proceeded thus gropingly two or three miles further when on a sudden Clare became conscious of some vast erection close in his front, rising sheer from the grass. They had almost struck themselves against it. "What monstrous place is this?" said Angel. "It hums," said she. "Hearken!" Feeling sideways they encountered another tower-like pillar, square and uncompromising as the first; beyond it another and another. The place was all doors and pillars, some connected above by continuous architraves. "A very Temple of the Winds," he said. The next pillar was isolated; others composed a trilithon; others were prostrate, their flanks forming a causeway wide enough for a carriage; and it was soon obvious that they made up a forest of monoliths grouped upon the grassy expanse of the plain. The couple advanced further into this pavilion of the night till they stood in its midst. "It is Stonehenge!" said Clare. "The heathen temple, you mean?" "Yes. Older than the centuries; older than the d'Urbervilles! Well, what shall we do, darling? We may find shelter further on." But Tess, really tired by this time, flung herself upon an oblong slab that lay close at hand, and was sheltered from the wind by a pillar. Owing to the action of the sun during the preceding day, the stone was warm and dry, in comforting contrast to the rough and chill grass around, which had damped her skirts and shoes. "I don't want to go any further, Angel," she said, stretching out her hand for his. "Can't we bide here?" "I fear not. This spot is visible for miles by day, although it does not seem so now." "One of my mother's people was a shepherd hereabouts, now I think of it. And you used to say at Talbothays that I was a heathen. So now I am at home." He knelt down beside her outstretched form, and put his lips upon hers. "Sleepy are you, dear? I think you are lying on an altar." "I like very much to be here," she murmured. "It is so solemn and lonely--after my great happiness--with nothing but the sky above my face. It seems as if there were no folk in the world but we two; and I wish there were not--except 'Liza-Lu." Clare though she might as well rest here till it should get a little lighter, and he flung his overcoat upon her, and sat down by her side. "Angel, if anything happens to me, will you watch over 'Liza-Lu for my sake?" she asked, when they had listened a long time to the wind among the pillars. "She is so good and simple and pure. O, Angel--I wish you would marry her if you lose me, as you will do shortly. O, if you would!" "If I lose you I lose all! And she is my sister-in-law." "That's nothing, dearest. People marry sister-laws continually about Marlott; and 'Liza-Lu is so gentle and sweet, and she is growing so beautiful. O, I could share you with her willingly when we are spirits! If you would train her and teach her, Angel, and bring her up for your own self! ... She had all the best of me without the bad of me; and if she were to become yours it would almost seem as if death had not divided us... Well, I have said it. I won't mention it again." She ceased, and he fell into thought. In the far north-east sky he could see between the pillars a level streak of light. The uniform concavity of black cloud was lifting bodily like the lid of a pot, letting in at the earth's edge the coming day, against which the towering monoliths and trilithons began to be blackly defined. "Did they sacrifice to God here?" asked she. "I believe to the sun. That lofty stone set away by itself is in the direction of the sun, which will presently rise behind it." Then the posse shows up, and in the short final chapter Tess is executed.